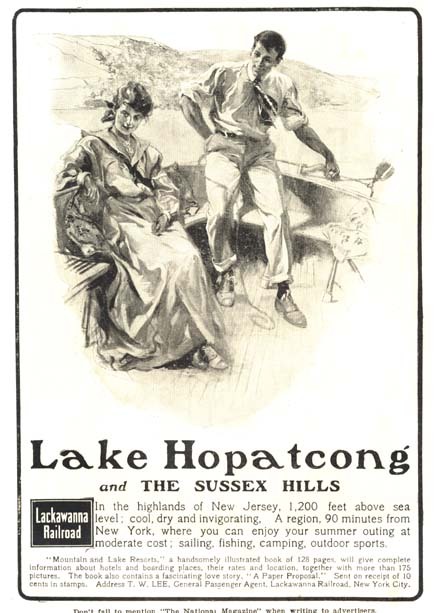 This full page advertisement, first published in a popular magazine in 1898, was one in a series of ads designed to lure city dwellers to the "cool, dry and invigorating" hills around Lake Hopatcong. The ads were placed by the Lackawanna Railroad, who owned and operated the rail line and station at Landing, NJ, one of the two competing railroads servicing the Lake. The other was the New Jersey Central Railroad with its station at Nolan's Point. This ad ran until 1904. 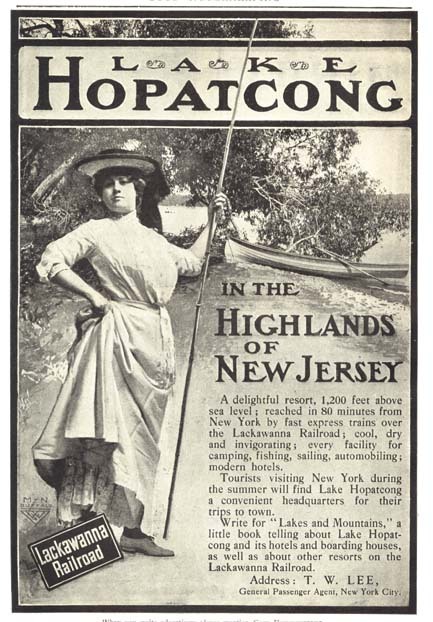 This fetching Lackawanna ad ran in 1903, with the same lure of the cool Mountain air, but now the element of romance has been added. 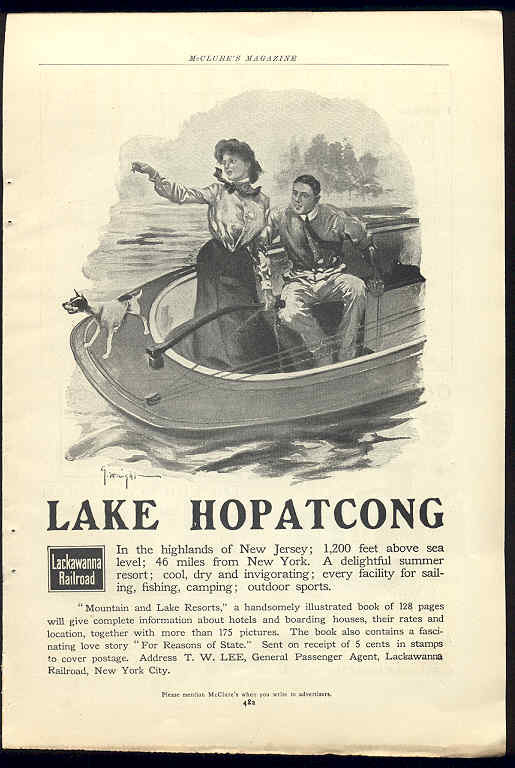 The ad offers a "fascinating love story" set at Lake Hopatcong, as an additional incentive. Apparently, the 'boy meets girl' angle loaded up the Lackawanna Trains, as this 1905 ad continued that theme. The Lackawanna Trains would unload Passengers at the Landing station at the south end of the Lake, and from there small steam launches would take them to their waterfront Hotel resorts around the lake. As times changed and Lake tourism declined, seasonal bungalows and year round homes sprung up around the Lake. In Landing, several builders offered homes, like this early 1950's ad for "Shore Hills Estates". This early 1950's ad for "Shore Hills Estates" promoted the recreational facility, now known as Shore Hills Country Club and Beach. Automobile 'License Plate Toppers' were popular in the 1950's. This one was for Shore Hills Estates. 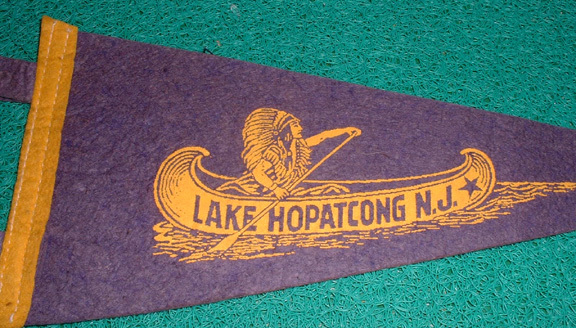 This page can only begin to cover the rich history of Lake Hopatcong. 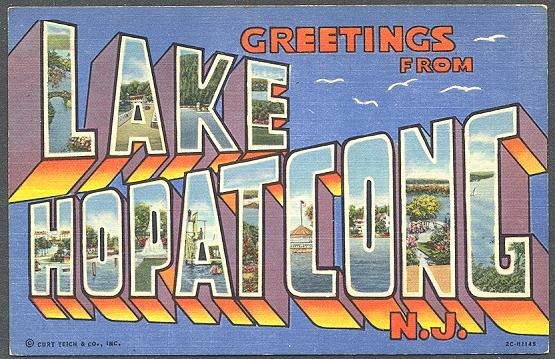 While this website is an independent effort, we recommend a visit to the The Lake Hopatcong Historical Museum at the State Park, open Sunday afternoons in the Spring and Fall. Admission is free, donations accepted. Landing, New Jersey is part of the Municipality of Roxbury Township. A link to the "official"
website of Roxbury Township can be found on our "Links" page.